Detroit Red Wings 2019 Draft: Forward or Defense in the First Round? It’s understandable if Detroit Red Wings fans were conflicted with the team’s recent winning ways. On one hand, it’s great to see the Red Wings find some consistency and add to the win column, especially with a young lineup leading the way. But the positive play also lowered Detroit’s chances of landing the first-overall pick in the 2019 NHL Draft. Now that the season is over, the Red Wings have the fourth-worst record and will likely pick outside of the top-two, which, in all likelihood, will end up being Jack Hughes and Finnish winger Kaapo Kakko. What should the Red Wings do if those two are off the board by the time they step up to the podium? Usually, the organization chooses the best player available. But for this year’s draft, the next four or five players after Hughes and Kakko vary according to which rankings you’re looking at. For the sake of this exercise, we’ll turn to a quick simulation from Tankathon to see where the Red Wings will pick. The results: sixth-overall. Before determining whether a forward or defenseman should be selected, it’s helpful to take a look at the depth chart to evaluate Detroit’s strengths and weaknesses. Up front, the Red Wings could use another top-tier center – you can never have too many top-six centers. But when you add in Dylan Larkin, Anthony Mantha, Andreas Athanasiou, and Tyler Bertuzzi, their forward depth looks pretty good, especially if their recent crop of first-round draft picks can turn into key contributors within the next few seasons. On defense, it appears that the organization is lacking a true top-pairing defenseman (or two). They have a plethora of prospects with NHL potential, but none primed to be the go-to guy for the next decade. If you look around at top teams’ rosters, a common theme is having a solid one-two punch down the middle. The Pittsburgh Penguins have Sidney Crosby and Evgeni Malkin. The Washington Capitals have Evgeny Kuznetsov and Nicklas Backstrom. Meanwhile, the Red Wings have Larkin. Athanasiou is just not on the same level as Detroit’s future captain, despite an impressive 2018-19 season. What about Joe Veleno? He had an impressive draft-plus-one campaign, but it’s not guaranteed that the QMJHL star develops into a top-six forward at the NHL level. Adding another top center to the prospect pipeline only increases the likelihood that Detroit will have a great pivot combination down the road. And if the best player available is a wing, that’s fine too. Having another Filip Zadina-caliber player in the top-six would be a nice luxury. As mentioned above, Filip Hronek and Dennis Cholowski may be best suited for a top-four role, instead of being the go-to guy. Either could probably be the second blueliner on the top pairing, but not the stud that you depend on – a Nicklas Lidstrom-type player. Or, for a few contemporary examples, someone like Victor Hedman, Roman Josi, or Morgan Rielly. 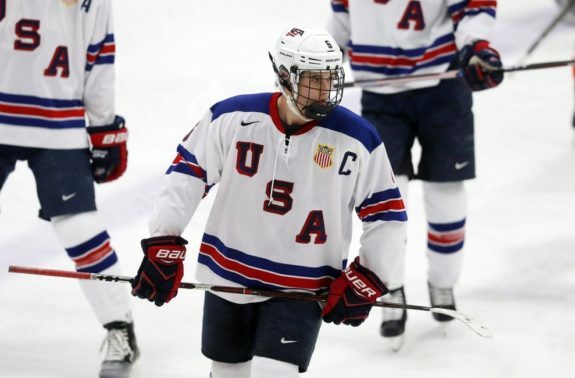 Grabbing a blueliner early in the 2019 draft would likely give the Red Wings a go-to defenseman, but one that likely wouldn’t join the big league team for a couple of seasons. Nonetheless, there’s a need. Between forward and defense, there’s a bigger need on the blue line. Adding a surefire top-pairing defenseman alongside Hronek, Cholowski, Gustav Lindstrom, Jared McIsaac, and Detroit’s other top prospects would (finally) give the Red Wings a dangerous defensive corps. However, the team should not reach with their early selection. Arguably, there’s a drop-off after Bowen Byram on defense. If the young rearguard is off the board by the time Ken Holland needs to make a decision, he should draft the best player available – as usual. Should the Detroit Red Wings draft a forward or defenseman? Share your thoughts below.